Now to answer the questions of how this relates to Russell within academia, and what can be learned from his resolutions. While the demons Russell spent much of his life wrestling are made most perspicuous by his romantic life, they were present, too, in his scholarship. Through the course of his career he wrote on every major area of academic philosophy (with the exception of aesthetics), concentrating mostly on metaphysics, logic, mathematics and epistemology. He dabbled in more-or-less very sphere available to him, never quite settling enough to merit the branding of a specialist. Beyond philosophy he was yet more fickle, alighting every subject from politics to literature, all with a firm aversion to truly committing himself to any one of them. It would seem that, despite the significant contribution he made to the twentieth century, Russell was unable still to place himself within the world of academia. He often described his lifelong ‘search for knowledge,’ the search for a domain that could sustain him—a quest which went, for the most part, unsatisfied. Whether Russell’s inability to discover his true raison d'être came at the expense of his work is neither here nor there; what should be taken from this is that he lived his life in torment and self-discontent, desperate for a place to belong, as a result of his own personal philosophy. Though he eventually found happiness in some areas of his life, he may well have had more success—and indeed more happiness—had he instead revised the way he looked at things. Can it be said that we should not look for identity in the things we do? Would Russell have been happier had he adopted the attitude of his eighty-year-old self from the very beginning, free of all neuroses and expectations of self-discovery? I would support such an idea. Those who search for themselves within something else—whether that be a lover or a scholastic interest—are forever bound to disappointment, for in the search’s necessity alone they are lost. A nameless proverb has circulated the Western world for a long time: WE ARE WHAT WE DO. Is this fair? Is this even true? Is the waitress a waitress and nothing more? Am I, for writing this very article, a philosopher and a philosopher alone? Am I to be classified in this way, as accords my choice in degree? This idea I would not support; and I believe it was this way of thinking that compelled Russell, and so many others, to spend their lives in pursuit of something that was never missing. In the preface of his Autobiography Russell described how his life was governed by three passions: his longing for love, his search for knowledge, and his unbearable pity for the suffering of mankind. Could there be a more noble set of passions in governance of a man’s life? Indeed it would seem not, but Russell’s avid determination to fit perfectly into these moulds rendered him bitterly unhappy for eight decades. He sought to see himself cemented in these goals, sublimely coalesced, as to avoid feeling unworthy of them. This, I believe, was unwise of him. We seek to find ourselves in what we do, as a means of finding somewhere to belong, and I believe this to be tragically misguided. I would proffer an alternative proverb, one which instead insists that WE ARE WHAT WE LOVE. I am a philosopher, yes, but if I were to tirelessly scour the discipline in search of myself I would die an unhappy man. Instead I would characterise myself as one who loves philosophy, one who is passionate about philosophy, and one whose identity may be comfortably characterised by my feelings towards philosophy. Here we leave no question of my identity, an identity which is in no way contingent on an infinite procession of qualifications, such as those Russell set himself. Had this been the way in which Russell approached his life from the very beginning, in the way of his marriage to Edith, I believe he could have enjoyed great happiness in concurrence with phenomenal success. He was a wonderful man, a marvel of brilliance, and ought to be remembered for his love of what he did, and not the things he was all too human to achieve. Thomas, M.. (2011). Bertrand Russell Autobiography - Poem With Distinction. 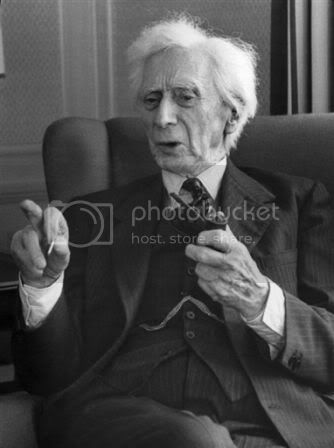 Available: http://allpoetry.com/contest/2570623-Bertrand-Russell-Autobiography---Poem-With-. Last accessed 01/02/14. Russell, B. (2009). Autobiography. London: Routledge. Preface.